When you put on your shirt and lace up your boots, you have to win. Otherwise, you should stay at home and watch television. In 1965, Rinus Michels took over as Ajax coach in a bid to pull themselves away from the relegation zone, and achieved it. However, Michels’ goals were much higher than that and having won the league in the very next season, he realised there had to be changes if the Dutch club aimed at European success. Michels was undoubtedly one of the best – or perhaps, even the best – tactical minds to have graced football, and and it is not particularly surprising when he realised in 1966 that even though he had at his disposal, some of the best attackers in the continent in Piet Keizer, Sjaak Swart and of course, the young Johan Cruijff, that his team will never reach the zenith without a solid defence. Tonnie Pronk and Frits Soutekouw were not horrid defenders by any means, they just did not have the attitude or technical prowess Michels expected his defenders to have. The Dutchman had played under Jack Reynolds at Ajax and the Englishman’s philosophy of attack being the best defence and looked for a player who could emulate that characteristic on pitch. Moreover, Michels realised that though there was an abundance of talent, the correct mindset was missing. Too often, as Dutch mentalities can tend to be, there was a lack of a winning mentality in the young Ajax squad. They lacked the arrogance, (which for many, is what actuallywould turn out to be the hamartia of the Oranje in the 1974 World Cup final) and self-assurance. So, Rinus Michels set out on an expedition to search high and low for a player who ticked these boxes for him, perhaps the final jigsaw of his own goudenploeg (golden team). In short, he was hoping to chance upon Velibor Vasovic. Knowing that Ajax would contest in the European Cup, having won the Eredivisie, Michels was not one who would settle for losses in Europe, writing them off as ‘experience’. As a result, his search began right after Ajax had triumphed in the league. Michels had watched Vasovic’s Partizan lose to a Real Madrid with the likes of Pirri and Gento in Brussels, but was highly impressed with the Yugoslav centreback’s tendency to burst out in attack when he was in possession of the ball. He approached Vasovic through a mutual friend and official talks were held in October of 1966, a few months before ‘de Mistwestrijd’ thrashing of Shankly’s Liverpool and the subsequent disappointing exit at the hands of underdogs Dukla Prague. 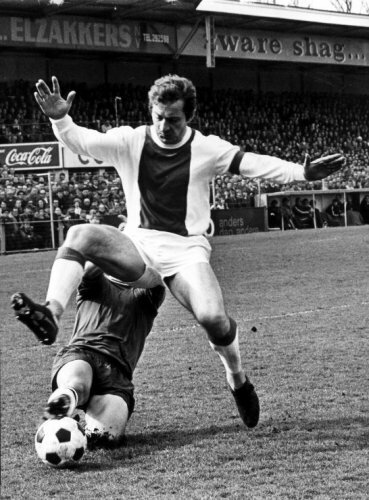 Vasovic was not satisfied with the price offered by the Amsterdam club, but wanting a move away from Belgrade, with Ajax the only viable option and convinced with Michels’ vision for the club and his own role in it, Vasovic signed for the Godenzonen in December 1966 and was immediately drafted into the first XI, paired with Barry Hulshoff, 8 years his junior. Vasovic himself was not old at the time, only 27, but in comparison to the rest of the Ajax squad, he was a veteran and he knew it. By no means, modest, he realised then the impact he could have at the football club, just by sharing his experience and showing the younger generation how to play in order to win. “When I came, I preferred to play a kind of total football. I played the last man in defence, the libero. Michels made this plan to play very offensive football. We discussed it. I was the architect, together with Michels, of the aggressive way of defending. I did small things, like make an offisde or stand in the wall to make a gap for goals. When you see examples from other players on field, you learn a hundred times better than in training,” he said, with the same air of confidence he had around him when he arrived at Ajax. His self-assurance became contagious at the de Meer, not the least infecting Johan Cruijff, who looked to the Prozevac-born defender like his elder brother. As we gaze back at the past now, his last sentence there could not have been more true. With him around, his young 19-year-old partner in defence, Hulshoff learnt how to read the game with precision, so much so that though Michels asked of him to be stronger and rougher on field, he never had to, because he would never let attackers get that close. Ruud Krol, who played leftback when Vasovic was at Ajax, would later become a sweeper himself has also acknowledged the Yugoslav’s input in his own development as a player, talking about how he would try to emulate Vasovic. Moroever, Vasovic had a resilient aura about him that was ever so vital in transforming Ajax from a team that played beautifully to a team that won beautifully. There was a lot more steel in the Golden Ajax team than many romantics would have you believe and Vasovic made sure that the defence remained efficient while being offensive and aggressive. Vasco was one who certainly knew the detour from the road of arrogance to the road of complacency and with the help of Michels, made sure he and the team were on the right track. Looking a bit like Johan Cruijff’s older, stouter brother too, Vasovic was given the captaincy by Michels, hence making him the first ever foreign player to have captained Ajax, and he got the honour of being captain in the clubs’s bid to win their first European Cup. But as he was, four years previously in Brussels, Vasovic was denied the chance to get his hands on ‘Big-Ears’ even though he had scored in his second European final, though this team his Ajax were beaten soundly by Milan. 4-1 it ended and by the end of the match, Vasovic had but one resolve. He knew his career was not going to last long, especially with his asthma, even though he was only 30 at the time. Even though they had just won two Eredivisie titles on the trot, nothing matches the exultation of being decreed as the best in Europe. ‘Vasco’ was possibly the one determined, more than anyone in that Ajax team to win the European Cup. Perhaps the biggest aid for this dream of his, came in the form of a 19-year-old, wild-haired Dutch lad with a penchant to run equally wildly at the opponents, the young Johan Neeskens. In a way, Neeskens brought the best out of Vasovic himself. Neeskens would hound the opposition into their own half while Vasovic realised his defence’s relative positions compared to the opponent attacker’s and urged his defenders to move forward and decrease the space or ‘pitch’ available for the opponents. This was effectively, the invention of the offside trap and the high line that Ajax still use today. All these tactics were not yet known of in other shores and this meant 1971 was the year, when Velibor Vasovic would get third time lucky and lift his and Ajax’s first European Cup, as captain. With that, he would hang his boots up, only 32 and only having played 13 full seasons in his entire career. He had found his Holy Grail and he was content, leaving the Netherlands as an Ajax legend and having spearheaded some of the biggest tactical innovations football has seen and uses today. Dutch football writer for The Guardian, FourFourTwo and more. Honestly didnt had a clue who Vasovic was but after reading this , now i know alot about him. Very informative article.